Bookbinding has been part of our heritage since Frederick Farrant established Nottingham-based FF Allsopp in 1901. And with associate company Sisson & Parker; the business became one of the largest school exercise book suppliers in the city and county of Nottinghamshire. We are very proud of our heritage and our family values including our meticulous attention to detail and concern for high standards of customer care. We believe each one of our clients is as individual as our custom made products and with more than a century of handcrafting behind us, we know how to create quality books and photo albums that are made to last. Our team of highly skilled craftsmen and women take great pride in offering a truly bespoke service with every album and guest book handmade to order. Crafted from the finest materials, all our photo albums are made with archival quality paper and include acid-free glassine dividers to protect and preserve your precious memories. With our well-established reputation for excellence we will help you create family keepsakes to treasure down the generations. 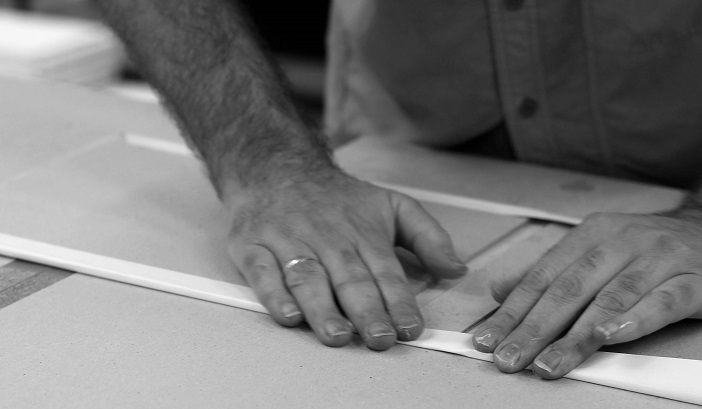 At The Bespoke Album Company we are proud of all our craftsmen and women who are carrying on the great tradition of handcrafted bookbinding. Read our profile of artisan binder Gary Orange who tells us why he thinks you can judge a book by its cover. Our artisan binder Gary has more than 40 years’ experience having completed an intensive five-year apprenticeship back in the 1970s. This saw him working in the bindery, and attending college and night school, as well as weeks at a time studying in Leicester. With a period of education longer than many degree courses you can see why Gary is now at the top of his tradecraft. 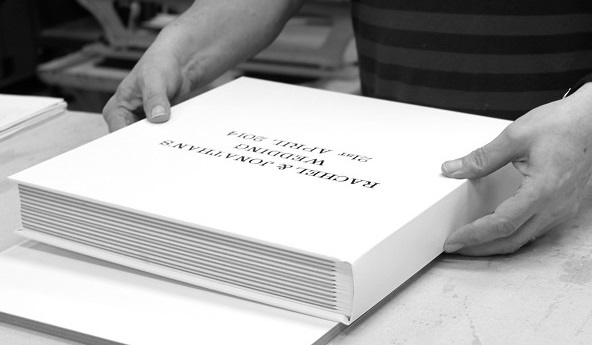 There isn’t anything that Gary can’t turn his hand to in the bindery whether its frame-sewing book leaves together or getting the pressure right on the vintage presses to bind the covers. Gary explains: “I love what I do and the best part is making one-off books and albums. The really special thing about them is that you know that every single one is going to be slightly different, there’s never going to be another exactly the same. Why not watch our video of Gary at work carrying on the great tradition of hand binding and finishing a clamshell presentation box for one of our luxury leather wedding albums. 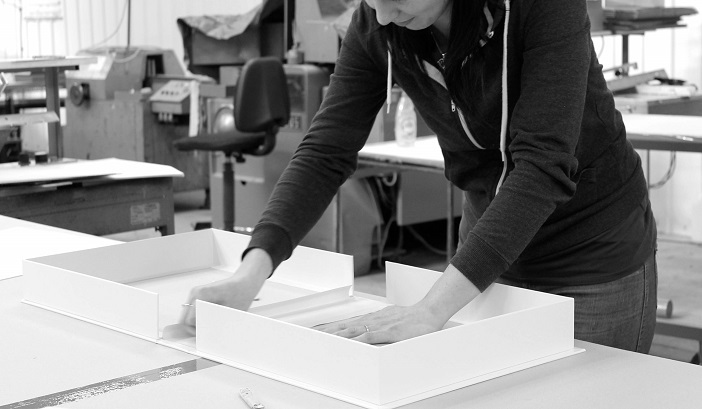 Keeping precious memories alive is at the heart of what we do at the Bespoke Album Company. We are so proud of our heritage that we wanted to share it with you by naming our selection of luxury leather wedding albums after key figures and locations in our history. Named after company founder Frederick Farrant Allsopp in recognition that FF Allsopp is where our bindery began and still makes beautiful books today. Walter Samuel Sisson and Joseph Parker joined Frederick in 1903 to expand the business beyond stationery. They steered the company through difficult times during the First World War that saw Frederick working by night at the Chilwell Ordnance Factory as part of the war effort. In 1944 FF Allsopp saw John Loach join the firm. John progressed to become the company’s managing director with his son Bob keeping up the family tradition by following in his footsteps. Over many decades both father and son steered the firm through major changes and developments in the industry whilst growing its reputation for reliability and excellence. Bob Loach is now the current chairman of FF Allsopp & Co Ltd. The Granby commemorates FF Allsopps 1904 expansion and move from 166 Alfreton Road to Granby Street in Nottingham, the factory purchased for just £4,160 in 1919. This remained the bindery’s home until 1961 when the street was demolished to accommodate the widening of Maid Marian Way. In 1917 FF Allsopp became an incorporated company, Walter Samuel Sisson & Joseph Parker were invited to become directors and joint owners of FF Allsopp. They also owned the Sisson & Parker bookshop on Wheelergate, Nottingham in the 1960s and 70s. The late 1920s saw Gerald Gisborne - nephew of Walter Samuel Sisson join the firm, becoming managing director in 1944. Gerald lived to the grand age of 101, only recently passing away in October 2013. More feedback from our lovely customers and if you'd like to leave your own review of our handmade photo albums or guest books you may do so here.